Mariano Ledezma and Sue Marquez, husband and wife owners of Fiesta's in Edwards, stand with their four children at the restaurant on Friday. 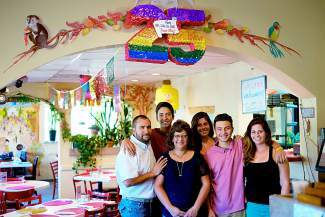 The family is celebrating the business' 25th anniversary on Sunday with a fiesta. EDWARDS — It’s fitting and proper that Fiesta’s restaurant celebrates its 25th anniversary Sunday with, well … a fiesta. Two and a half decades ago, the Marquez sisters took the long drive from Vail to Edwards to get into the restaurant business. “It was pretty adventurous at the time. 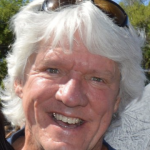 Edwards was a long distance phone call from Vail,” said Sue Marquez. Jerry’s Deli was in Edwards. So was the Gashouse, selling 10-cent draft beer. Three corners of Edwards’ Highway 6 intersection were dirt fields. “We dreamed of having a small fraction of Vail’s business of those times,” Sue said. They could seat six at the bar, if everyone liked each other, and had 10 tables. They remember playing Frisbee in the dirt parking lot when it was slow. Mariano Ledezma, Sue’s husband and the chef, remembers their celebration the night they sold 34 dinners. Now they average more than 12 times that. On Sunday they’re celebrating 25 years and have become a Vail Valley icon. The restaurant business can be brutal. In 1989 and the early ’90s after they started, they did everything themselves. They had the dream, lots of ambition, and a bunch of their family recipes. They had worked in the restaurant business most of their lives. “We’re from a large family and Grandma and Mom were awesome cooks and they passed down recipes of New Mexican style cuisine,” Sue said. Their mother worked nights, so it fell to the Marquez sisters to cook dinner for their family, so they had plenty of practice with these recipes. The recipes are a family secret. In fact, their employees have to sign a confidentiality agreement. “Several times a day people ask us for the salsa recipe. One of our servers used to say, ‘If I told you I’d have to kill you,’” Sue said laughing. They purchase their red chile from the same family farmer in New Mexico their grandmother did. They combine two styles of Mexican cuisine, the recipes passed down in the Marquez family, and Ledezma’s family recipes from the heart of Mexico. There’s their New Mexico and Colorado chiles, passed down for generations. Their signature white sauce is a Fiesta’s creation. They’ll celebrate throughout the day Sunday, indoors and outdoors. They’ll have lots of kids activities, piñatas and disc jockeys. The Mexican band Los Jefes will play beginning at 3 p.m.
For the 25th anniversary they bought a barrel of tequila from the Herradura, who has been making tequila since 1870. Sue traveled to Amatitán, Jalisco, Mexico, and tasted several, before selecting the one they’ll serve for Sunday’s celebration. It’s double barreled, which means it’s aged, put in a different barrel and aged some more to make it smooth.